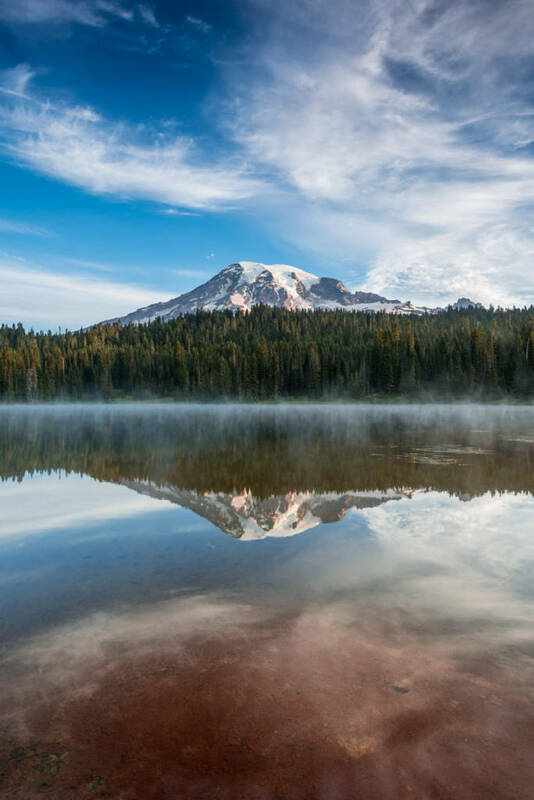 In August I went to Washington for a Photo Tour of Mount Rainier National Park. The trip was another gift from my fantastic wife. 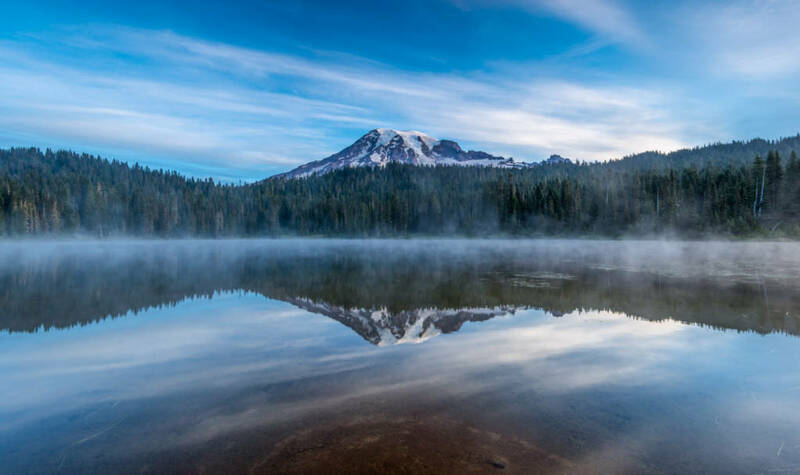 One of the highlights of the tour, guided by Aaron Baggenstos, was a sunrise shoot of the mountain reflected in the appropriately-named Reflection Lake. We were extremely fortunate to have a calm morning and a beautiful mist floating over the lake. Visiting the location the day before I noticed the interesting reddish color of the lake bed in this spot, so when we arrived the next morning I knew exactly where I wanted to be for my composition. The nice sky and clouds and the mist over the lake were just very pleasant bonuses! The above image is a composite of 3 vertical captures at 25mm. This was my first trip to use my new Nodal Rail, which eliminates parallax error when panning the camera on a tripod. The finished panorama ended up being about 11,700 x 7,000 pixels in dimension. The above image is from the same location but a little while later as the sun was starting to hit the mountain. I like this vertical composition because of the reddish-brown color and texture of the lake bed. November 18th, 2013 | Categories: Landscape.